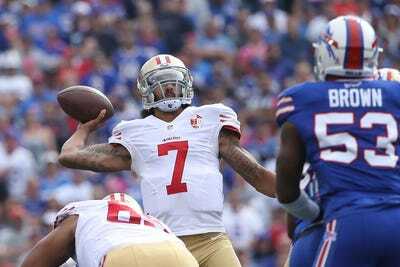 After opening the season at 1-4 and looking particularly hapless on offence, the San Francisco 49ers announced this week that Colin Kaepernick would make his first start of the season against the Bills on Sunday. So far, the only question he’s raised is why the Niners didn’t start him from the get-go. In the first half against the Bills, Kaepernick went 8-for-11 for 137 yards, and added 20 yards rushing. He also threw a gorgeous, 53-yard touchdown pass — his first since October 18, 2015. There are plenty of other problems to be solved in San Francisco before the Niners can legitimately compete for a playoff spot, but a solid Kaepernick is certainly a nice start.